The Vampire V4 by Apollo Team is a standalone or upgrade kit for Amiga computer systems that will significantly upgrade the capabilities of the original as well as modernize I/O. The V4 will be available by Christmas of 2017 and will cost north of €120. Forget the new Atari console, it's time to dust-off your Amiga. Making their commercial debut in 1985, the Amiga was a family of personal computers by Commodore most notable for their graphical user interface (GUI), mouse, and superior graphics and audio over the competition. The Amiga might be over 30 years old at the moment, but there is still a company selling accelerator cards for the system. Earlier this month, Apollo Team announced their Vampire V4, which comes both as a standalone system or upgrade. The original Amiga, also known as the Amiga 1000, paired a 16/32-bit Motorola 68k CPU running at a speedy 7 MHz with 128 KB of ram, which was expandable to 256 KB. The Vampire V4 replaces the Motorola 680x0 CPU with an Altera Cyclone V A5 FPGA, which presumably uses an ARM Cortex A-5 SoC. It isn't clear which A-5 it will make use of, but it is a sure bet that the A-5 and the 512 MB DDR3 RAM the V4 packs will make it quite the upgrade for any Amiga system. 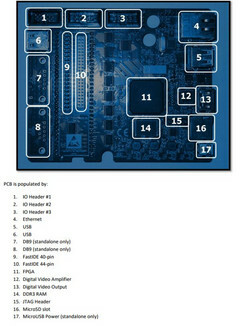 The I/O of the board has received a refresh as well (see diagram). Pricing has not yet been released, but Team Apollo says it will arrive in Q4 2017 and will cost more than their existing Vampire 600 V2 upgrade kit, which sold for €120.